Lex Luthor, you just refuse to end your vendetta against Superman don’t you? Well, at least it’s beneficial to those picking up Injustice: Gods Among Us on April 16th. As soon as they rip off the cellophane from their copy of the game, so it shall begin, the fulfillment of bringing Superman to his knees. 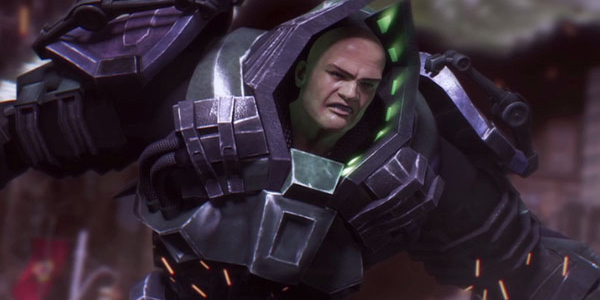 Besides revealing Lex Luthor as a playable character, the new trailer also unveils some of the motivations running through the minds of our favorite characters within the Injustice: Gods Among Us world. Wonder Woman offers us a tasty tidbit from on top of a tank with, “Man’s aggression cannot be tempered, only quelled. We are here to save mankind.” Of course, you probably already knew what the superheroes were trying to do. I mean…what are they ever trying to do besides save mankind? Lex Luthor beautifully elaborates on his disdain for those of the super persuasion as he says, “No good comes from hero worship.” I would completely agree with Lex, but a part of me just refuses to stand by his enormous mech suit, and let me tell you why. Having access to massive amounts of resources allows him to fight against the best of the superheroes, but without his mech suit he just doesn’t seem like much else than a guy in a tie, who is slightly crazy. Yeah, I know. You could say the same about Batman except without his suit, Bruce Wayne is a ninja. Oh, there’s one more part of the trailer we forgot to mention…what was it? That’s right, a Joker tease! Be sure to watch the trailer all the way through, and let us know who you plan on playing as once Injustice: Gods Among Us launches!